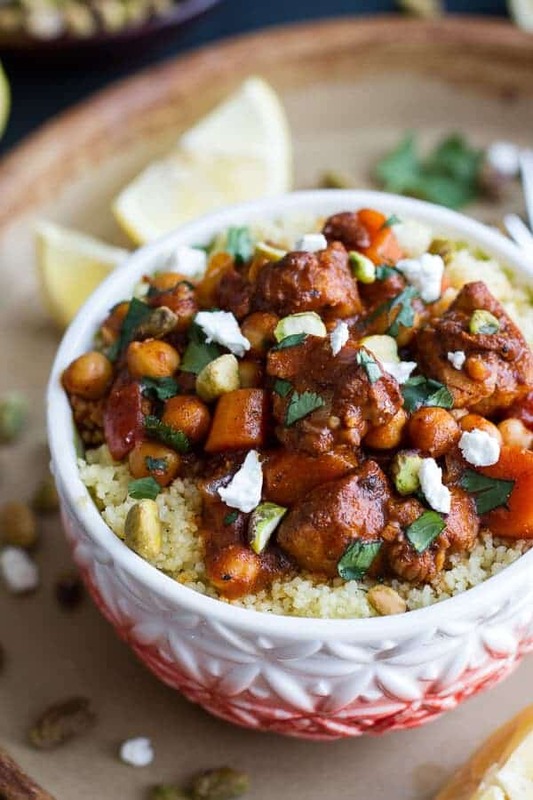 One Pot Moroccan Chicken + Chickpeas with Pistachio Couscous and Goat Cheese. New Favorite dinner right here. Currently I am extremely into flavors that my very average, no worse than average, family is so not into trying. 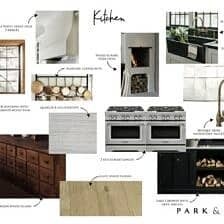 This means that I basically want to cook all the things: seafood, vegetables, spicy, sweet (while actually they do love spicy and sweet) and all of the rest of the stuff they just are not on board with….. The last few days I have been cooking whatever the heck I want to… and it is awesome. Most of the family is actually outside of Pittsburg, PA right now at Seven Springs Resort for another Burton Open or something like that. Which is actually kind of ironic since I am here with all the snow (an there is a TON) and they are there with not a whole lot of snow, high winds, some rain and now an ice storm. Anyway, with no one to cook for I have a ton of food so please come over and get some. Oh but, do not come at night because I will probably be very freaked out and end up either hurting you or me. Do not know, it could go either way. I may be scrawny-ish, but I grew up with boys. Trust me, I learned the hard way how to hold my own. I have also been getting a little more creative with things. It’s good. Well, at least I think so. This one is honestly one of my favorites of the week. For one, it is so easy and all you need is thirty minutes, one pot and some pantry staples. It can go from a chicken dinner, to vegan dinner without compromising any texture or flavor. The only reason I added chicken was because I had some on hand that needed to be used up, but you can totally leave the chicken out and swap it with more chickpeas and veggies. In a small bowl toss together the smoked paprika, cumin, cinnamon, coriander, cayenne pepper, salt and pepper. Heat a large high sided skillet over medium-high heat. Add some olive oil to coat the bottom of the skillet and once hot add the chicken and half of the seasoning mixture to the skillet. Brown the chicken all over until cooked through, about 6 minutes. Remove the chicken from the skillet and set aside. To the same skillet add a little more olive oil to pan and swirl to coat. Add the onion, ginger, garlic, red pepper and carrots to the skillet, sauté 4-6 minutes. Add the remaining spice mixture and sauté another 30 seconds, stirring constantly. Add the chicken back to the skillet. Stir in the tomato paste, chipotle chile, chicken broth, and chickpeas. Bring to a boil and reduce the heat, and simmer 5-10 minutes or until the mixture thickens. Remove from heat. Stir in the cilantro and lemon zest + juice. Taste and season with salt if needed. To serve, divide the couscous among bowls or plates and sprinkle the couscous with the chopped pistachios and dates (if using). Top each plate of couscous with the chickpea mixture. Sprinkle on the crumbled goat cheese and garnish with chopped pistachios and cilantro. EAT. Perfection in a bowl. Obviously. 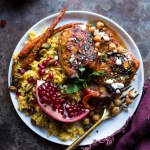 Crockpot Honey Harissa Chicken with Chickpeas, Feta and Jeweled Pomegranate Rice. 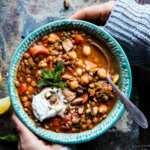 Crockpot Moroccan Lentil and Chickpea Soup. Moroccan spices are my favorite! I love the picture of the spices in that awesome chippy plate/bowl thing! This looks fab Tieghan. I haven’t done a lot of chickpea-ery in my life, but i’ll try anything with goat cheese. You say EAT, I say YES. Haha! Thanks Taylor! My family is not big on chickpeas, so I am using them when I can! Tieghan! Words cannot describe the beauty of this dish and it looks over-the-moon delicious! Gorgeous photography, girl. I’m so glad you are having fun being creative while the family is away. Hopefully, they’ll start drooling when they view this post and beg you to remake it! 😉 Thanks for sharing. Pinning! Awe, thank you so much!! You are so sweet, Stacy!! Have a great day and thank you for pinning! This bowl is just bursting full of flavors and I LOVE IT. I am ready for dinner at 7am!! Looks so good!! Haha! Thank you so much, Jenny! Moroccan food is one of my absolute favs! Loving all the goat cheese on top—dee-lish. 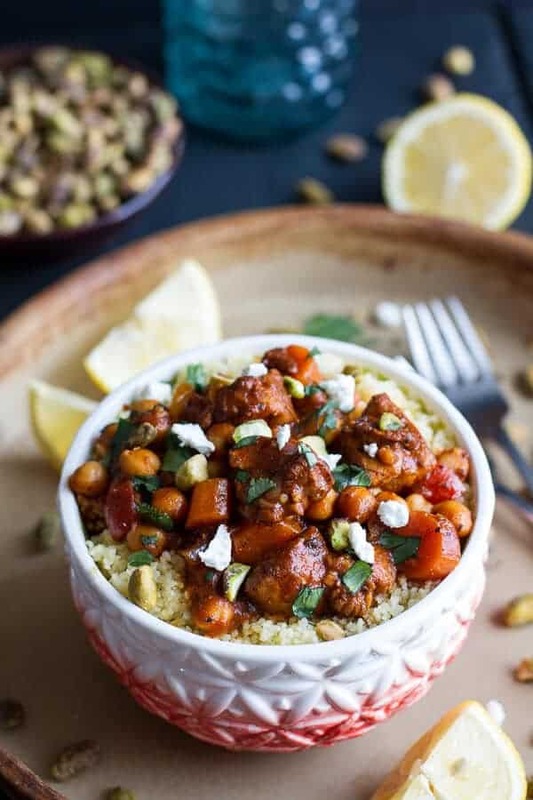 I am definitely going to have to try this one—been craving something couscous lately! pinned. You have my favorite food blog OF ALL TIME. I would give anything to have a sister who cooked as well as you! I would never bother to eat out! Congrats on all your success!! Definitely, obviously, perfection in a bowl. YUMZ. Haha! I am all about less dishes to wash! Wonderful, wonderful flavors going on here. And so pretty! Thank you! I am am really liking the different Moroccan flavors these days! 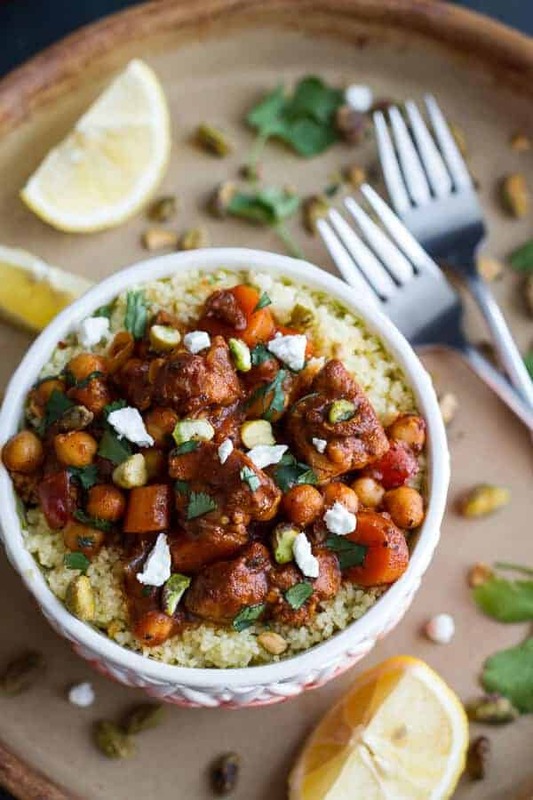 love the warm spices here – goat cheese and chickpeas, its really the way to my heart. Do you think I can make this ahead of time and will store well? 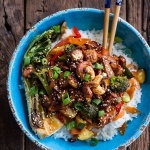 The flavors in this dish look amazing! I wish I could come over and half a couple of bowls full! Beautiful! So have you ever thought of pitching the idea to the food network of being their youngest chef? Your food can totally go head to head with those other chefs and blow a few away (not naming names). Haha! You are so nice! Thank you, Linda! That is a huge compliment, but I have never thought about that. Not sure I could be on tv annyway! Somehow you make things sound so good that I can’t stop myself from clicking, even though I’m a vegetarian and this is chicken. For some reason I just had to click. And now I kind of want to eat it haha. Stop doing this! Well thanks for clicking over!! 🙂 You can do this with just chickpeas and no chicken! That family of yours just doesn’t know what they are missing! I made something similar to this just the other day and can’t wait to try your recipe. These are some of my favorite flavors. YUM! Thanks Amber! I love these flavors too! 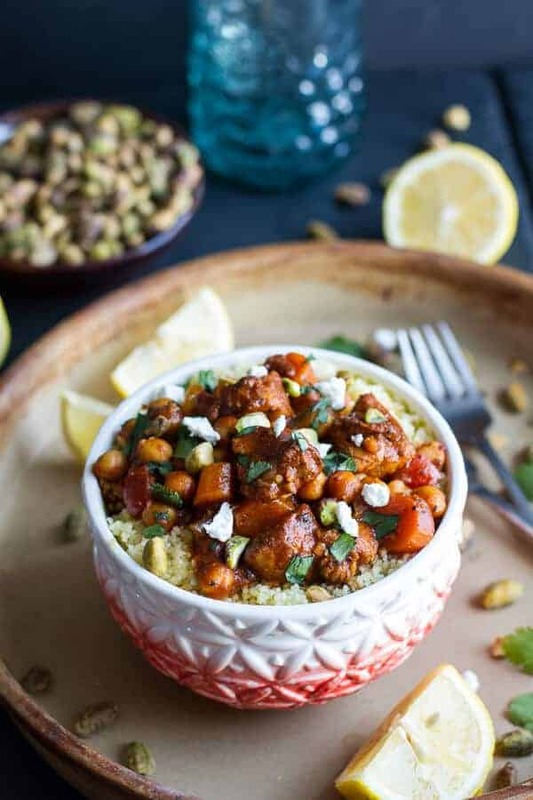 Anything with Moroccan flavors is WINNING in my book!! This looks amazing! I need this tonight for dinner! Love the ingredients! 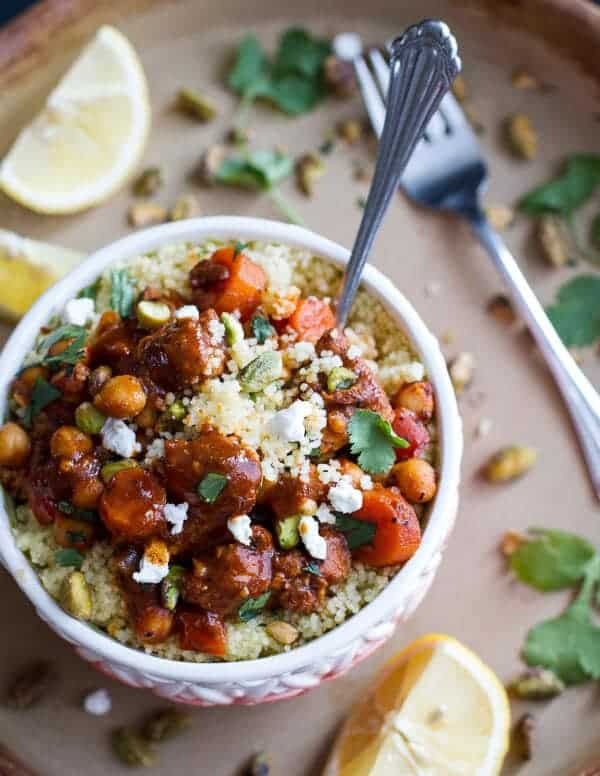 This is my ideal dinner, I love your blend of spices and I need pistachio couscous in my life! Thanks so much, Laura! I love spice mixture too! This sounds AMAZING and sooooo easy! GREAT recipe! I will very happily come join you for dinner while your family is away! This dinner is right up my alley! 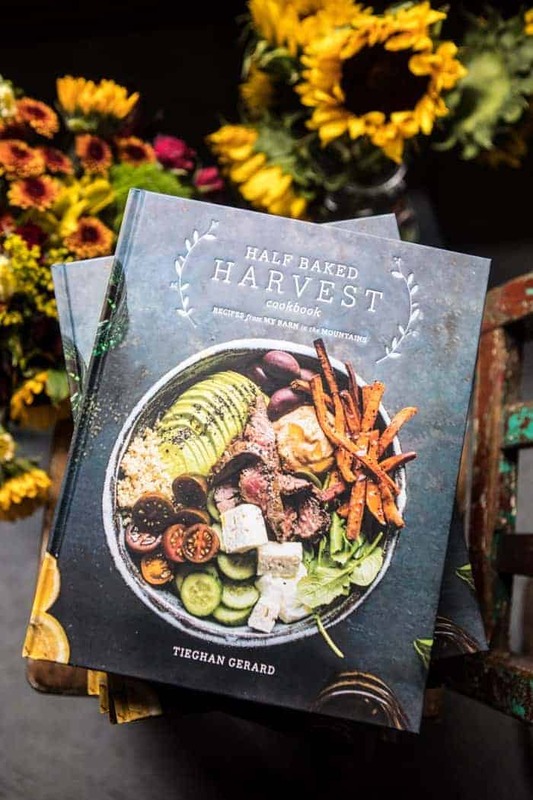 Love the goat cheese addition and all the amazing flavors! Ha! I would love that! Thanks Kelli! This looks absolutely fantastic. Shared it on my Facebook page! Um, yes, when do I come over? Seriously though–this dinner looks amazing. And then you went and put goat cheese crumbles on it. LOVE. Oh and the goat cheese is a must. Perfect topping! Love all the pretty pottery against that dark blue background, Tieghan! And what a fabulous recipe- I’m a fan of anything Moroccan. Pinned! SOLD. 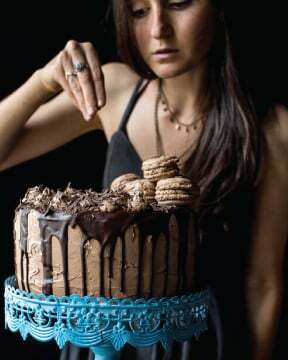 So making this next week! So many spices. I love it. Looks very delicious! Definitely going to try this one. I finally found somewhere here in Canberra (Australia) where I can buy chipotle chile and have been looking for a great recipe to try out my new find. Oh awesome! So happy you finally found them. Hope you love this! This is so incredible!! You are so talented it’s insane – gorgeous!! Thanks! This WILL be tonight’s dinner! Thanks Sherri! So happy you love this!! 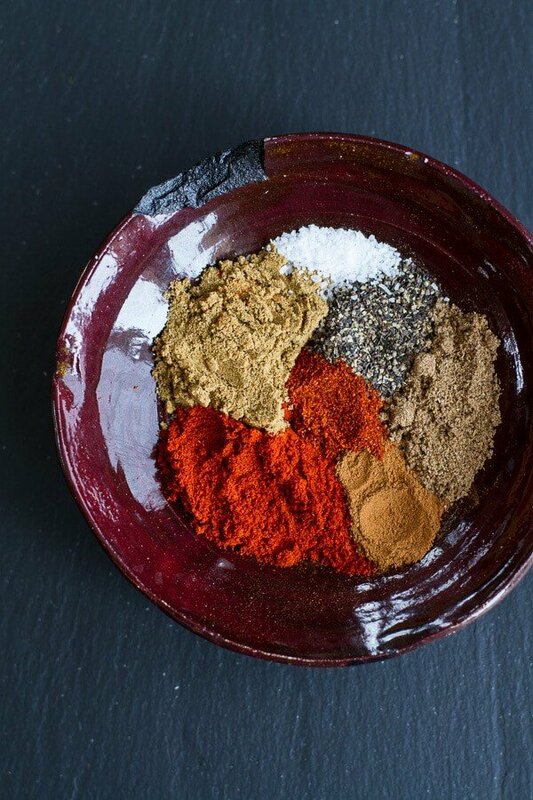 I love that beautiful plate of spices! Morrocan food includes wonderful tastes! 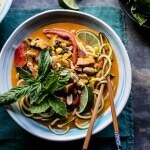 This looks like an amazing and flavorful dinner! My boyfriend is very allergic to carrots. Is there something else I can substitute? Something about the same price? This was amazing!! My husband loved it. Can’t wait to make it again! Thanks Sandra! So happy you guys loved this!! Hey Teighan, I included your chicken bowl in my Valentine’s Day Recipe Roundup! Delicious. Love these spices, love pistachios, love chickpeas, love goat cheese 🙂 Will make it again, for sure. Thanks!! So happy you loved this! 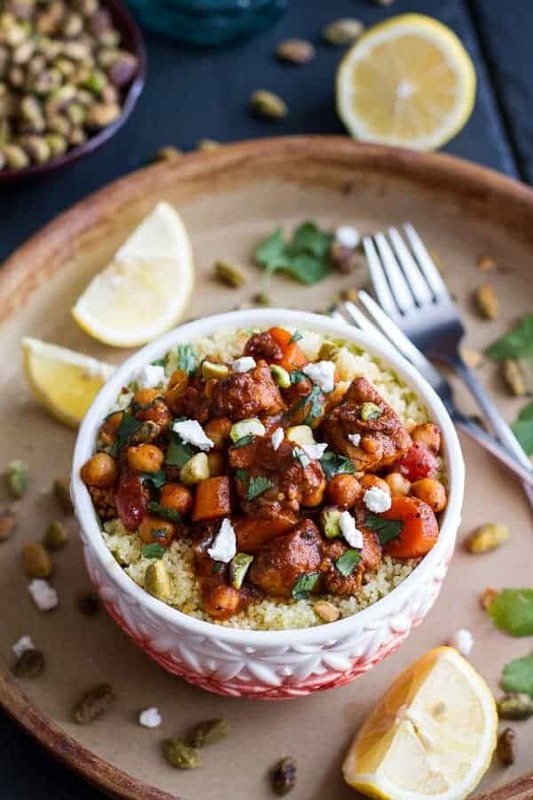 Love Moroccan dishes like this and that goat cheese on it would be amazing! Thanks Kevin! The goat cheese is the perfect last touch! This was amazing! Loved it and it was so easy to throw together. This looks so good. I’ll be your family and come eat all the food if they won’t! Hi Trista, I would use chili powder, cayenne pepper or just leave it out. Hope that helps and let me know how it turns out, Hope you love this! Thank you! So happy you love this! What a great dish! The seasoning was perfect. I actually used leftover rotisserie chicken so it cooked up super quick.I will definitely make again. So happy you loved this dinner! Thanks! Wow, the goat cheese completes this dish!! I had this recipe saved for a few days in the hopes of using up some leftover couscous, and this so wonderfully hit the spot! Our chicken had turned on us too, so I was glad to have had the vegan suggestion to double the chickpeas. I went for more of a traditional Moroccan feel with raisins and pine nuts in the couscous, but there was just enough heat in the main mix to really crave the creamy goat cheese. Just outstanding. Oh my goodness, this is soooo good! 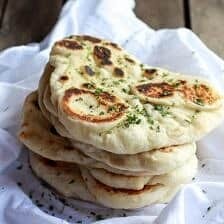 I stumbled across this recipe when trying to find one which would use up a bunch of ingredients that I had on hand. Love love love! I will now checking out the rest of your recipes! Thanks. YA!! So excited you loved it. THANKS! Hope you enjoy everything you see! This is one of THE BEST things I’ve eaten in a very long time. I found it to be better than chicken noodle soup for curing a cold. I am definitely making it one of my go-to meals. I was a little nervous to use Indian coriander instead of regular coriander (I don’t know the difference, it’s what I had on hand) but it turned out PERFECT. Thanks so much for sharing! Haha! No way, so awesome!! I am thrilled you love this meal. THANK YOU! My 13-year old and I loved this meal. It is a feast for all the senses and we’ll definitely make it again! I also want to compliment the layout and photos here. It’s all so beautiful and inviting. We’re trying your “Asian BBQ Boneless Baked Chicken Wings” tomorrow!! This was just what I was looking for to emulate a dish I had out at a small restaurant where everything was cooked to order. I cooked just the chicken portion of this and served over plain cous cous and it was DELICIOUS! I can only imagine it would add even more flavor to use your cous cous. I added some dried apricots and raisins to simulate the dish I had at the restaurant and I bet almonds would be nice, too! I love this dish and have made it a couple of times already! I’m making it tonight for a big crowd – any tips on the best way to triple the recipe? Should I cook it in batches and keep it warm on low in a different pot? HI! You can cook it all in one big pot, that should be fine. THANKS!! I made this tonight and it was delicious! Amazing spice blend and creative meal. It took ~90 minutes from the time I opened the recipe to eating bc of all the chopping involved, but it was worth it. 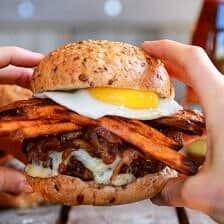 My husband and I have big appetites and got 4 servings out of this recipe. I’m really happy you and your husband enjoyed this! Fabulous! I’m moving this one to my “Go To Dinners” Pinterest board. Thanks! Awesome, I hope you love it Tina! This looks incredible! 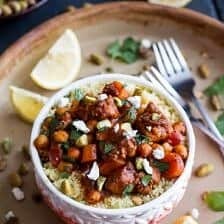 I am vegetarian, so do have on question: would I treat the chickpeas like the ‘chicken’ in the recipe? 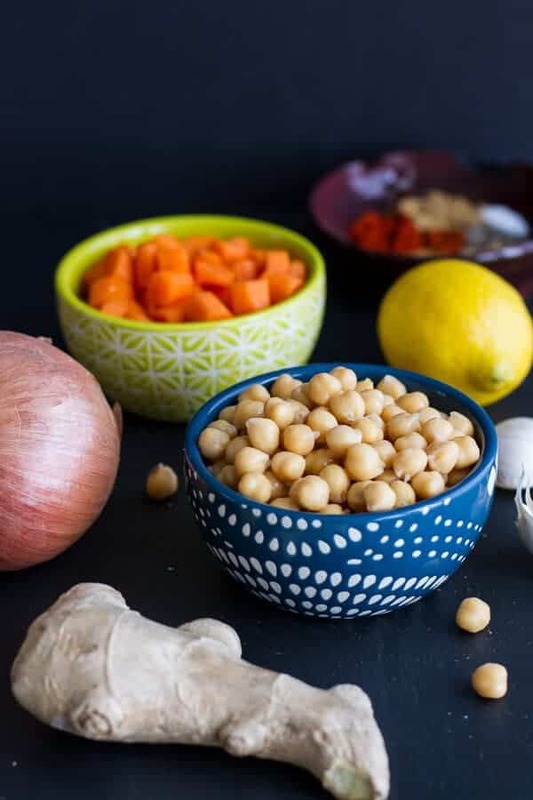 Or would I start with step two (adding the onions, ginger, bell pepper, carrots, etc to the skillet) and add all of the chickpeas at the same time? Thanks for sharing such amazing recipes! That is a perfect alternative! Thank you Rachel, I am so glad you enjoyed this! 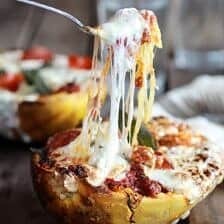 Pretty late on this one, but I’m going to make this for 10 people on a ski trip and am trying to figure out if I should double or triple it; does anyone know approximately how many the recipe serves? i rarely post on blog recipes, but i have to say, just made this recipe tonight & it was wonderful! i couldn’t find the adobo pepper, so added some adobo salsa, and then added a bit of roasted cauliflower – amazing! I am so glad you loved this Emily! Thank you! I made this tonight. It’s was wonderful! I omitted the salt but other than that followed instructions to the T. Delish!